Fantastic historical photo from Fort Benning circa 1941, prime example of a military pup tent setup. Pup tents is one of those terms that almost everyone has heard at some time or another, and while it often brings up a fairly accurate mental image, for a lot of people they realize they don’t actually technically know just what a pup tent is compared to say any other tent. Pup tents aren’t just one or two person tents (regardless of what many online websites bring up as search results for the term) but they refer to a very clear design and style that actually gained its fame all the way back during the time of the American Civil War meaning that, yes, the pup tent design is over 150 years old and marching straight towards that remarkable 200 year mark. A term used to describe this style of tent from the very beginning, pup tents are very simple in design referring to small tents usually for 1-2 people (in a cramped space) under a triangle bit of material with one front pole and one back one. They have long been associated with the military due to their history, but in recent years are seen as a beginner’s tent to get kids used to playing outside or even camping in the backyard before heading out on the real deal when they’re a little older. Read on to learn more about pup tents and our picks for the best ones out there in the market today. So Where’s the Best Selling Pup Tent? No one sells a premium tent for $20. There’s a reason almost every major brand from the big name tent manufacturers focusing on even small one or two person tents have long since forgone the classic pup tent design to go with something that is more sleek, designed more contained, and offers better options for most long distance hikers, backpackers, and campers. Pup tents aren’t for major camping or for long range trekking, but these are for areas that are pretty much always sunny without much wind, and are best for backyard camping most of the time, although there are some slightly higher level pup tents that can work for more wild excursions. However, the design is what it is and this is not a tent designed for space, ventilation, or anyone with high end tent needs but can still serve its basic purpose. Great shot of this tent pitched with rain fly over top. One of the best choices out there, River Country was a brand that was fairly new to us, as it was one we just weren’t overly familiar with, but their pup tents are some of the best out there for sure! This pup tent is marketed as a trekking pole tent ready for all weather issues, and it is very light and compact that can be used with any current pair of trekking poles (sadly they do not include any) to quickly set up shelter whether hiking, backpacking, or camping. This is sizable for a pup tent yet compacts easily making it very easy to pack and put away whether in a pack, for your next camping tip, or even as a very compact and incredibly useful item for your bug out bag. The River Country tent itself is over 7 feet long by 5 feet wide and tops out at 42 inches tall at the apex. Although they don’t come with any poles, the tent can be easily set up with almost any pair of trekking poles or even any stick that is over 42 inches in height. 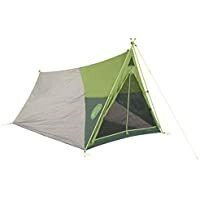 The tent itself is only 2 lbs and 9 oz making it very light to carry, although it is a little bit more if you add stakes, carrying bag, and rain fly (recommended). 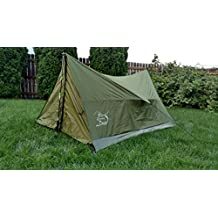 The versatility is a focus here for the backpacking and ultralight backpacking crew, who when using this tent have no need now to carry tent poles and trekking poles since the latter can work as the former for them. Good shot of a set military surplus pup tent setup. Hey if you want a quality pup tent why not go to the original source? This U.S. military tent half shelter is the classic modern design of a pup tent, easy to setup and enough space for two people in tight quarters or one and some gear. These pup tents come with basic stakes (tent pin design) and section poles to allow for quick and full setup. 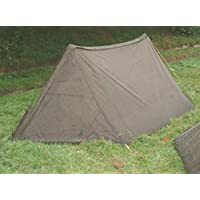 Available in a standard olive drab color, this tent is also referred to as a basic A frame or half tent shelter and is made from a sturdy cotton material. These come as two “shelter halves” which will then be buckled together to make one solid pup tent. With this particular design it’s important to note that there is no floor – these are just two halves going over the top so you will want a tarp, poncho, or something similar to use as a ground sheet. Having a solid air mattress pad is also not a bad idea even if you’re sleeping on it with a sleeping bag. These are best for good weather areas because this is not a waterproof setup, and while it can be great for what it is designed for – it’s not designed to give you everything you want and more. This is what it is. Now if you don’t mind roughing it, this is an excellent option and you can’t deny the quality of construction but be aware up front of the limitations this surplus option has inherent to its design. One of the best ways to describe this would be a strong dose of nostalgia that actually remains as functional as ever for campers or outdoor enthusiasts who don’t mind a little bit of roughing it. Another outstanding pup tent option. This military surplus option definitely offers a quality piece of equipment that we know many of our outdoor enthusiast readers will fully appreciate. 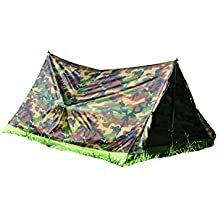 This two person pup tent is advertised as being the genuine deal, coming from the military surplus of the French Army and offering a tent that is 60 inches by 80 inches, as well as the poles, stakes, ropes, and carry bag. Made from nylon canvas, this pup tent has an attached waterproof floor and built in water repellent on both the walls and the roof. This definitely takes it a step above and beyond several others on the list who don’t offer that same level of quality materials. This is a pup style military tent, and while a relatively small tent in size and design, for the little space it takes up there is actually a decent sized interior with a 60″ by 80″ floor space that can comfortably sleep two adults. This is an excellent option for individuals who are looking for a high quality pup tent, and this design includes rust proof zippered flaps for that little bit of modern extra upgrade from historical designs. Great use of emergency materials in pup tent form. This is an absolute great use of emergency material and awareness of potential emergency situations to create an awesome modern take on the pup tent that is perfect for when you need the right equipment most: in a sudden and unexpected emergency. This isn’t an all use tent the way the others on this list are but this is all about having that crucial and important shelter in an emergency situation. The orange on the outside makes it easy to spot by searchers and indicates the possibility of being in need while the interior is coated with aluminum and works the same way that emergency mylar blankets are designed to: by insulating and keeping all your body heat trapped within a small area to help give extra warmth and hopefully stave off hypothermia (ideally you still want a good sleeping bag, blankets, or other things, but this provides wind shelter and helps you keep in the heat that you do have. The dimensions are 82″ by 36″ to give you enough space to comfortably take cover while remaining tight enough to give you the largest benefit from use of emergency materials. This emergency tube tent is waterproof, offers shelter from the wind, and comes with four tent pegs (quality carbon steel that is zinc-plated to resist rust) and 23 feet of rope. While created as more of an emergency option, this SE emergency pup tent is high quality enough to be used multiple times in most situations, making it an even better deal. While not the ideal pup tent for every situation, you can see why we’re fans of this one and its very particular niche. Here’s a modern pup tent design from Kelty. The Kelty Rover Tent shows that some big names in the camping industry still pay attention to classic designs as the Kelty company calls their Rover tent a classic pup tent setup, but reinvented by using new & better materials that increase the overall appearance and/or flair, as well. Using a classic A-frame tent design that is often seen as the slightly larger version of the classic pup style of tents, this tent earns major points for being easy to set up, as well as easy to take down. Unlike most pup tents which are basic and boring, the color & design makes the Kelty Rover really stick out in a way that will gain attention. 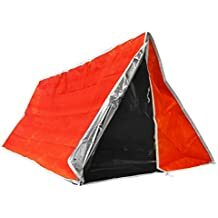 Kelty does a very nice job of understanding what this type of tent is, what it is used for, and delivers on creating a fun little tent made from good materials and including quality stitching, solid design, and it holds up fairly well to most normal weather conditions. Not designed for winter camping or massive thunderstorms, but should be fine for a couple rainy nights without much issue. This is not a light tent for the size as the poles are made from a sturdy solid steel. Not for backpacking – definitely for site camping and a solid option for individuals looking for that modern style of a pup tent. Great looking camo designed pup tent. Texsport is a name that pops up every so often and they have earned their spot on this list with a solid 2-person camouflage trail tent that definitely follows the traditional pup tent design. Made from a strong and waterproof polyurethane, this tent weighs a mere four pounds and is easy to assemble. This tent is designed with a rear mesh window that allows for solid air flow, while there is a storm flap that can be zippered shut over it for protection against the rain. 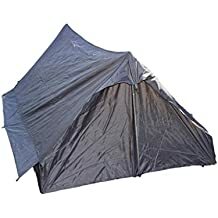 And unlike some other pup tents, this includes a solid floor so you don’t have to worry about having a ground tarp since you’re already off the grass. In addition, this tent comes with tent stakes as well as a storage bag. Add in the fact that the material meets the full CPAI-84 specs for being rated as flame retardant. That’s a lot of good traits for a very good looking modern pup tent that is easy to store, easy to set up or take down, and does have a strong amount of support from campers who insist on going with this style of tent. A great way to end our list of top rated pup tents. For individuals who really pay attention to pup tents it might come as a bit of a surprise that the specific brand that is often seen as the best selling or one of the most popular didn’t make our list. This is the Stansport Scout A-Frame Backpacker’s Tent, which has a huge number of reviews anywhere online you look at it. While there are plenty of positive reviews, this is a model that gets a lot of negative feedback, as well, enough so that we don’t feel comfortable recommending it. Look we fully admit that each person’s individual experiences can be different. I’ve had gear that lasted me for years and I watched the same company, same design rip out of the box for a friend on the first setup. There are plenty of extremely high or even perfect ratings for Stansport’s A-Frame Scout Backpacker’s pup tent, but there are many negative reviews to the point where we simply don’t see enough high end consistency to be able to recommend them. As always we hold the right to change this in the future if ratings and design improves. Pup tents have an impressive history, all starting out of the Civil War, and if you are interested in reading more about the actual history then another great resource that we recommend for you to visit all about the history of pup tents can be found HERE. Q: Aren’t pup tents just kids’ tents? A: No. While many beginning tents for kids are in fact pup tent by design, this design has been used in the past by many campers, by many people. Generally as tents have become better and better designed most companies have moved away from this to the point where pup tents are often just for kids in the yard now, but this wasn’t always the case. Q: Has the meaning of pup tent changed? A: Not completely, but it does seem to be heading in that direction. Since tents are becoming more carefully designed and improved, very few people use any type of a pup tent design any more. Why use one even for ultralight backpacking when you have all the other really lightweight and high quality one or two person tent options available out there. So now when many people type in pup tents, they are literally looking for companion tents for the family’s favorite four-legged friend, as you can see the changing definition here. Q: I was actually looking for a tent for my dog – do you guys have an article on that topic? A: Actually we do. Take a look at it here: best dog camping tents reviewed. Q: How did pup tents get their names? A: From Union Soldiers during the U.S. Civil War. The story goes that soldiers were given these tents from supply that were so small that Union soldiers felt like dogs crawling out of their shelter. While the moniker “dog” was given to a lot of army gear (“Dog tags” is still used to this day, for example) dog tents became pup tents, with one story even pinning it down to a regiment outside of Chatanooga where as a joke soldiers would bark at feet that walked by their tents. Q: When were pup tents first used? A: The pup tent design is pretty basic so forms of it have existed for a long time but the original design that became associated with the army and the name came from pup tents that were used during the U.S. Civil War starting in 1861. Q: Why choose a pup tent? A: There are several reasons, some of the chief among them being that these are often a great starter tent for kids and are very inexpensive. That’s a pretty good combination. While many people have moved beyond pup tents, there is something to the nostalgia of these for many people whether it’s memories of falling in love with the outdoors and camping or getting one of these while going through military training, there’s a lot to actually love about pup tents and the evolution they have taken to create newer (and many would say better) options, or at least perfecting the design. This is all we currently have to say on pup tents and we hope you found the post useful. Be sure to check out other parts of our site to learn more!